A selection of Animated films, listed below, will be shown in the main Auditorium from 12pm. In a waiting room in a clinic, two children meet while they wait to take blood, one of them has already done it while the other is his first experience. Magically appears Biwy, a monarch butterfly that accompanies our protagonists to discover the various phases of blood collection. A short film designed to explain to children how the sample works and reassure them by entertaining them. 3 Mins. A story about Death carrying out his grim job in the final days of the world. In his loneliness, he finds an unlikely friend. 5 Mins. A family take a trip to the coast where there are sand dunes. 14.45 Mins. Emily finds herself disconnected from the world around her. She relives different memories from her life and must look to her past to connect with the present. 9.23 Mins. 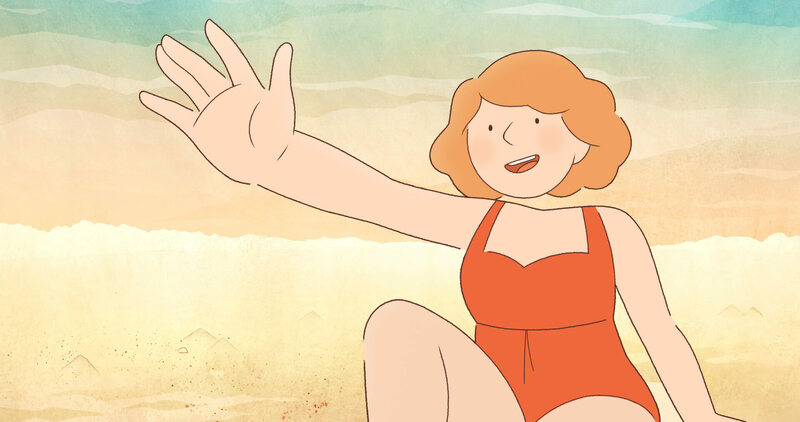 Glenda Jackson provides the voice of poet Stevie Smith in this animated interpretation of her extraordinary 1950’s poem ‘The Blue from Heaven’. Suzie Hanna has adapted and animated the poet’s own drawings to communicate her rueful, wistful, comic, and melancholy themes with music and sound design by Phil Archer. 3.39 Mins. Love is a random thing. Finding true love is a thrilling adventure, especially if personally involved as the target. 5.22 Mins. Alone in space, an astronaut drifts through the empty void. After finding another astronaut in the same predicament, she gives him a polaroid image of the Earth. Alone in space, an astronaut drifts through the empty void. After finding another astronaut in the same predicament, she gives him a polaroid image of the Earth. They then team up to go on an epic journey across the universe to return to their planet. Will these star-crossed lovers find a home? 7.40 Mins.